So many parents blame themselves for the way their children turn out. Earlier this week I received a long and lengthy e-mail from a parent. She is beating herself up for the lifestyle choices and the actions of her adult child. All I could think was, “if it was that easy.” “If we were responsible for them.” And the truth is that we control very little over what our kids do. We are tasked with setting a good example and for setting expectations, goals and a code of conduct while we raise them. In many ways we as parents are their first teachers. But talk with any teacher and you soon find out that some kids “get it” and take to their teachings and other kids need to learn from experience and in their own timetable and in their own way. I don’t think there was ever a parent that raised kids that said, “I want my child to grow up and be a criminal.” Yet many kids do grow up and become criminals. I don’t think any parent raises a child and says, “I want my child to grow up and become unhappy.” Yet many children grow up and become unhappy. As parents, we need to stop blaming ourselves. Kids grow up and make their own decisions and their own choices. 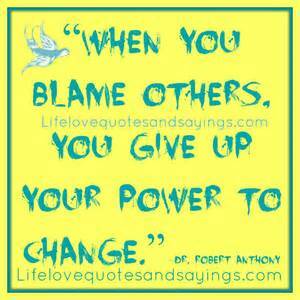 All blame is a waste of time and of energy. It serves no one. If you are a parent and you are doing that you need to change your inner voice as long as you blame yourself, your child will make you their target of blame. When life doesn’t go their way it won’t be about what they did or didn’t do but rather that they are afforded the opportunity to place blame on their parents. And many parents are willing to accept that role. I know because that used to be me. If I had my way all my children would be deliriously happy and successful. Yet that isn’t the case and it has nothing to do with me. We can barely get our 12 and 8 pound dogs trained to do what we want, why did we ever believe we would have that control over our children? Remember when we were all guilty of statements like, “it must be the parents.” Or “what kind of home did they come from.” I have witnessed children that were given nothing and they did everything with their lives and others kids that were given everything and did nothing with their lives. It all comes down to choices, personal choices. As parents we can’t change or even do anything differently after we have raised our children. Trust that you did the best that you could with what you had and what you knew at that time.